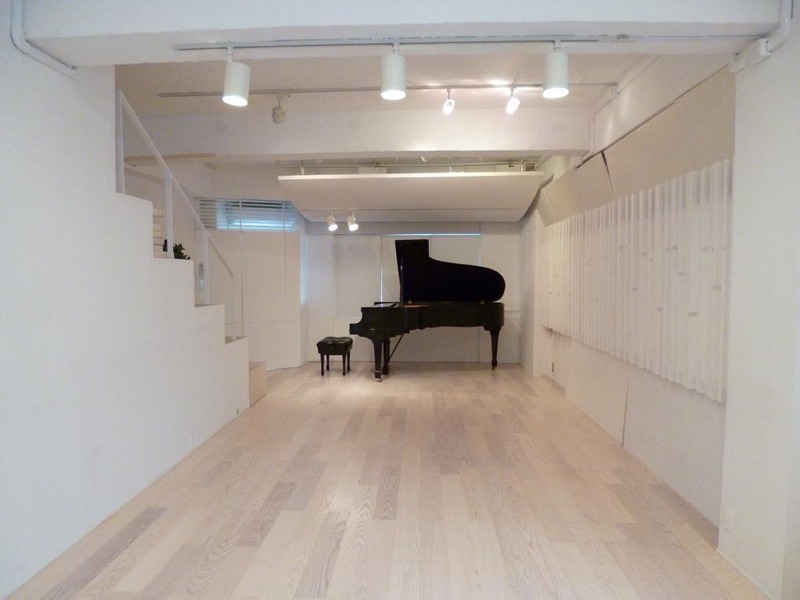 Looking for a place to practice/perform music in downtown Tokyo??? We have revised our fee schedule. The new schedule is applied for reservations made on or after August 6th (Sun) in 2018. For reservations made on or before August 5th of 2018 for use of August 6th or after, the lower of the new or the old pricing will apply. Special discounts for reservations made within 22 hours are applied only when you make a reservation over the net (ie., not by phone or e-mail). Now you can make a reservation on the net. Once you register, you can see the reservation status and can make a reservation for the vacant hours on your own. 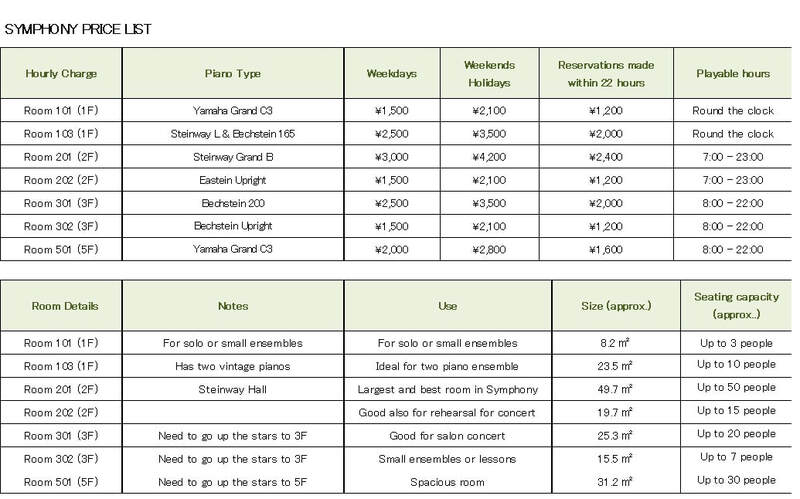 The hourly charge for the same-day booking has been reduced to 1,200 yen and up depending on the room/time (see the matrix below). 1. First, please register. Registration is very easy. Please click the above picture. If the instruction is given in Japanese, please click the national flag in the upper right corner and change it from the Japanese flag (the rising sun) to the US Flag (Stars and Stripes). You will see the instruction in the English language. You fill several basic data such as name and e-mail address, and you are done. 2. Once the registration process is complete, you are automatically transferred to the schedule page. You can easily see which room is taken at what time/day. You can make a reservation for the vacant hours. iPhone/iPad users are recommended to click "Convert to PC screen" (at the bottom of the screen) so you can readily see the whole schedule. 3. We recommend you pay by credit card. (We use Paypal, a very secure system.) Otherwise we accept yen cash only. 5. We strongly recommend you use the web-based booking. We continue to accept reservations by e-mail or phone, but in that case per hour charges will be higher by 300 yen. 6. We will accept reservations for up to 6 months' time. 7. If you want to stay overnight, please do not use the Web booking system, but send an email to us. 1. The details of reservation are shown only to the person who made a reservation and Symphony. Other people cannot see it. Privacy is protected. 2. You can make a reservation for up to 6 months. The minimum duration is 60 minutes, and thereafter, 90 minutes, 120 minutes, and so forth. You may make a reservation for just 30 minutes if you have other reservations within the same day, you use the room for trial, or the room is available only for 30 minutes due to unavailability before and after. 3. Special discount pricing (same-day booking) is applied if the booking is made within 22 hours before the starting time. The special discount pricing is applied also on Sunday/Saturday/holiday. Same-day booking is final, and no change is allowed. 4. You will receive a confirmation massage upon reservation. It shows the details of the reservation, how to enter the room, the lock number, etc. Please read it carefully. 5. You can extend the reservation by making new reservations. Please contact Symphony if you want to change, cancel or shorten reservations. Cancellation or reduction may be subject to cancellation charges. We ask that you make a reservation only when it is final. When contacting Symphony please use e-mails rather than phone unless it is very urgent. 6. The rooms 101 and 103 can be used round the clock. Other rooms can be used only until 22:00 or 23:00, but if you do not make a big sound, you may use the rooms even after that. Please contact us if you have such a plan since you cannot book the room by yourself. 7. Special fees are applied for overnight stays. If you want to stay overnight please contact us and ask about the pricing instead of making reservations on the web system. 8. Please make a reservation of Room 201 for at least four hours continuously between 13:00 and 17:00 on Saturdays/Sundays/holidays. Likewise, for Rooms 103, 301 and 501, please make a reservation for at least three hours continuously for the early afternoons on holiday/weekend. This will enable us to give priority to those who want to hold concerts or recitals. If the room is vacant within a week before use, you are welcome to make a regular booking of one hour or longer. 9. We strongly recommend you make reservations over the web. For reservations made over phone or e-mail 300 yen additional per-hour charges will apply. 10. If you want to use a pedal-extender for kids, please make a reservation. It is free of charge. But if you need more than one pedal-extender, it will be 500 yen for each additional extender. 11. For payments, we only accept Japanese yen cash (exact amount) or credit card. We recommend you pay by credit card. Give us a call or e-mail! We speak English!! Symphony Salon offers professional and amateur musicians the precious opportunity to practice piano, hold piano concerts, give piano and other lessons, practice various musical ensemble in Tokyo, and many more... We are very close to the center of Tokyo, within 3 minutes' walk from Exit 6 of the subway Monzen Nakacho Station on Tozai Line and Oedo Line. Monzen Nakacho Station is only 3 stops (5 minutes) away by Tozai Line from Otemachi (the center of the downtown Tokyo). How to get to Symphony Building from subway Monzen Nakacho Station. Please get off the subway and walk to exit 6 of Monzen Nakacho station, and go up the escalator to the ground level. You will find yourself in front of a supermarket "Akafudado". Walk to the right, and you will soon cross an express way which runs above you. Soon after, please turn to the right (before an eyeglass shop). Walk straight for a minute or so, passing several buildings, and on your left you see a small car park. (You see our building, a white five story building, just behind the car park.) Walk past the car park and turn left at the next building, and you will find Symphony Building on your left. The first floor of the building is also a car park. You can see inside of those rooms by clicking the Indoor View page. Note: No extra charge such as piano fee. Room 101 and Room 103 are available 24 hours a day. Room 202 and Room 301 are available from 8:00 to 22:00, and Room 201 is available from 8:00 to 23:00. For the availability of Room 501, please contact us. Please call us or email us for reservations or questions. We speak English.